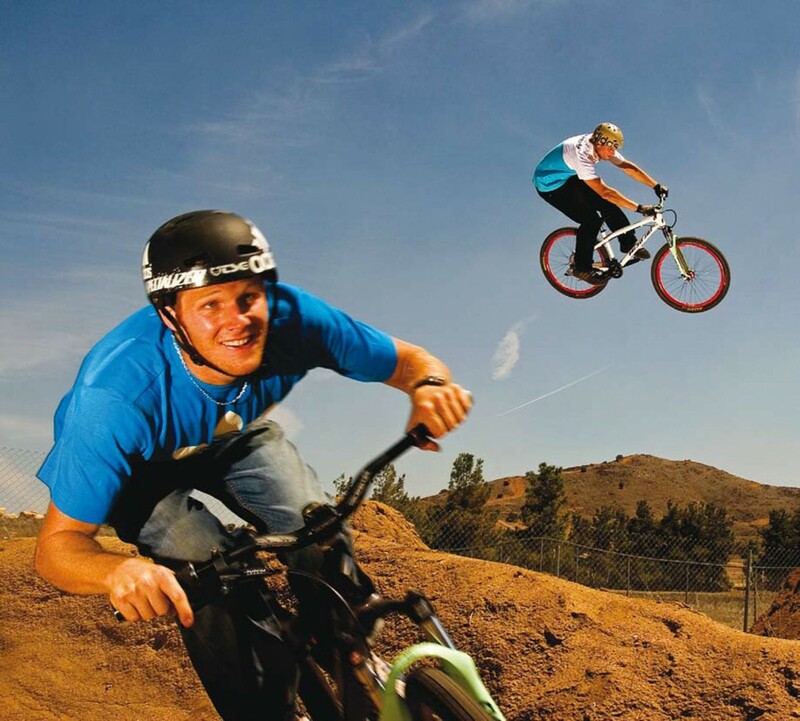 Getting it right while you’re still on the ground will make the airtime part easy. Although you may be thinking about the jump as the take-off and landing, add the few metres before the transition into your thoughts. You need to be planning and setting up a few bike lengths before the lip so that when you get there, everything is done already. One of the hardest things to master is learning the concept that, the less you do, the easier it’ll become. air and onto the downslope. On the run-in, spot your take-off point. 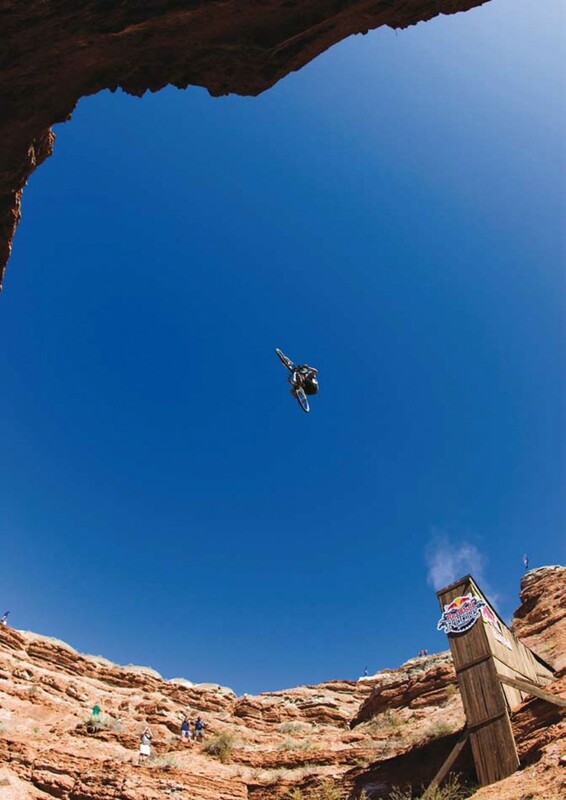 That should usually be the highest part of the jump. You need to try and make sure both tyres reach this point of the jump before they lift off. Hopping off the transition too early will only cut short your airtime and bring you down heavily with no flow. By keeping an eye on this point, it should be easier for you to gauge your speed and get the timing of all your movements’ right. Hand over as much work as you can to the trail. The more you can get from the dirt, the less you need to do yourself. Pump the compression before the jump starts to rise. If you’re coming in fast, you might not have to do too much, but if you’re rolling in slow, exaggerating the pump with your arms and legs will add height and distance to your jump. The pump can also add stability to your riding. The more planted you are on the ground, the more confidence and balance you’ll have so don’t let yourself get all light and off-kilter before you even get to the lip. As with most general trail riding, the bike is better stuck to the ground than it is skipping over the top. The pace you hit the jump at can be tough to gauge to begin with. Start slow and build up on tabletops, where the consequences of coming up short aren’t as severe as a double. The more jumps you hit, the more you’ll understand what’s going to be needed to get you the distance. Technique can also play a part. The more proficiently you pump, the slower you’ll be able to go and still clear the gap. If you can only reach the downslope of a small jump by frantically pedalling at the take-off then something’s amiss. Go back to the basics and refine your flow, balance and pump. Now that you’re approaching with the right speed and you’re solid and in balance, you can start to work more on the take-off. Pumping should have moved you slightly down and forwards to load the bike – like coiling a spring. Now you need to release that pent-up energy by following it up with a gradual move backwards. The lower you move from, the more balance you’ll have so recruit your hips into doing most of the work. Keep in mind that unlike a manual, where you do all the work, most of the effort will come from the physics of that spring, so keep all body movements very subtle. If you were to roll your bike at the lip without you on it, it would take off on its own so all you have to do is make sure you’re not loading the front wheel. All it’s wanting to do is take off – so just let it. As the 19th century proverb says, less is more. The rear end needs to mirror what the front has done only hundredths of a second earlier. As the lip is the take-off point, keep your weight off the front until your back wheel has rolled up the transition and is now at the same spot. This can seem difficult, but in actual fact it’s pretty simple. Just like you took your weight off the front by moving backwards, you should now take your mass off the back end by moving forwards again. Too much and you’ll either start a front flip or nose dive into the landing, too little and your rear tyre will stay planted on terra firma. It’s a fine balance, influenced more by your timing than by how much you’re moving. Subtlety is key, so keep the movements minute. If you’ve done all your jumping using the lip and the trail that precedes it then this part will be effortless – just like in those movies. It’s the hang-time you’re now experiencing where you can spot your landing or start trying tricks. If you feel like you’re holding the bike in the air, chances are you’ve gone for the old faithful yank on the bars and need to re-think your take-off. The pedals you’re using shouldn’t make a difference at this point. With the weight shift back and forwards, the bike wants to take off underneath you and will be following the path you set it on at the start. If the bike is dropping away from you, it’s back to the drawing board and time to re-master your take-off. Don’t take the easy option and fit a set of clipless pedals, they’ll only restrict you later on. We’re not talking Britney Spears here. The pop you get from the lip is the result of a number of things. As McCaul says, “You might have to bunny-hop more off the lip if you need more height than it’s going to give you.” In this sense, exaggerating the boost you’re going to get from the jump will require you to do a bit more work. It’s not worth trying this until you’ve got mellow, relaxed jumping dialled as the timings and techniques are a little more complex. Initiate the entire movement from the pump and use this compression as the trigger for all your other techniques to follow on from. On the approach get stable and central with your pedals level, push hard into the compression with your whole body weight and as you take off carry out the same moves as before but with extra effort and power. The bunny-hop can be introduced nearer the lip to squeeze that little extra from the height but make sure you’re still using as much of the transition as possible. Try and let your moves be dictated by the shape of the ground rather than just pulling a monster bunny-hop off the top. It won’t get you that far and will win you zero style points at the same time. This entry was posted on Sunday, November 27th, 2011 at 11:30 am and is filed under Bike . You can follow any responses to this entry through the RSS 2.0 feed. Both comments and pings are currently closed.